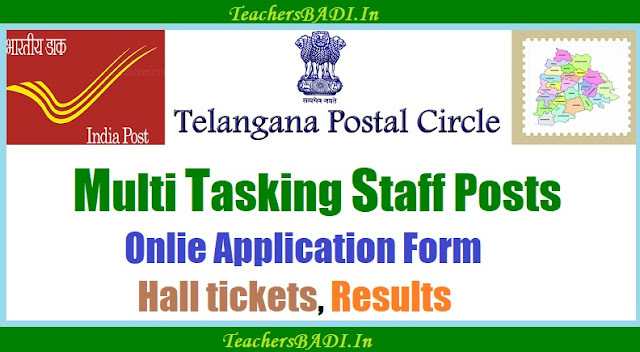 TS Post Multi Tasking Staff Posts Recruitment, Telangana Postal circle Multi Tasking Staff Posts online applying last date, India Post Telangana MTS Online Application Form, Hall tickets, Selection list results and more details @ http://ts.postalcareers.in/. TS Postal Circle, Hyderabad -Multi Tasking Staff Posts : Department of Posts, Office of the Chief Postmaster General , Telangana Postal Circle , Hyderabad has issued a recruitment notification on 09-12-2017 and the Department of Posts invites applications from the eligible and interested Candidates to fill up 33 Multi Tasking Staff Vacancies of the year 2017 in Telangana Postal circle, Hyderabad. Applications are invited from the eligible candidates to fill up the posts of Multi Tasking Staff in the following Units in Telangana Postal circle in the pay scale of Rs18000/- in level of pay matrix as per ]1h CPC +admissible allowances prescribed from time to time in accordance with Department of Posts (Multi Tasking Staff Group C , Non- Gazetted) Recruitment Rules 2015 notified in GOI Gazette No GSR 383(E) ,Gazette of India Extraordinary , Part II section 3 Sub section (i) dtd 14-5-2015.